Cutting for cuts sake: What was the government thinking when it came to power and cut £100m from the flood defence budget? 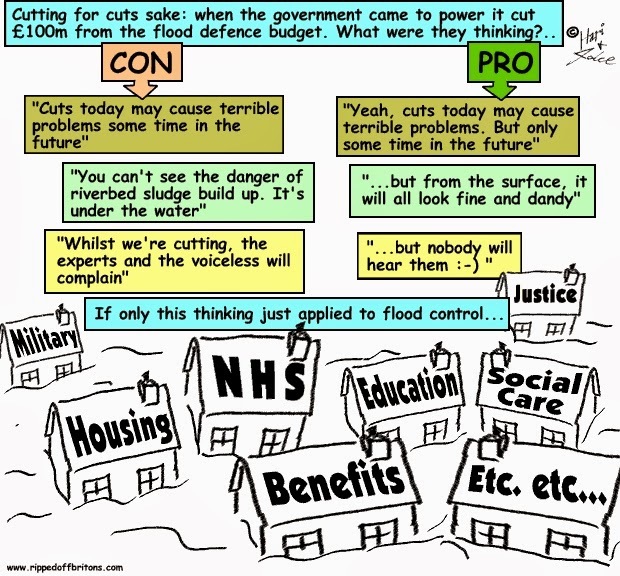 SOURCE CHANNEL 4 FACT CHECK: Government still mired in dubious flood claimsAfter the coalition spending review in October 2010, a decision was made to cut spending on Britain’s flood defences, to the tune of about £100m or 16 to 17 per cent in real terms in just one year. Spending was set to well below the level inherited from Labour in subsequent years. There’s no dispute about this cut. This House of Commons Library note provides chapter and verse on how various agencies reacted to it. It also says the cut came after Labour increased spending by three quarters in real terms from 1997 to 2010. The Association of British Insurers were particularly disappointed, as insurance firms had wrung a promise to invest more in flood defences from Labour in 2007 and they felt the coalition were welching on the deal. The cut wasn’t accidental. It was part of a broader strategy of reducing the deficit by cutting capital spending, something that happened across most departments. It’s difficult to see today’s decision to ramp up spending by up to 100m a year as anything other than an admission that the government was wrong to cut the budget by roughly that amount in the first place.